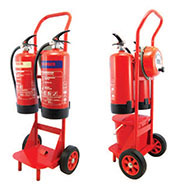 Apex Fire offers a complete line of industrial, commercial and for home use fire extinguishers. Our goal is to provide our customers with quality product at a great value. Extinguishers are made from heavy duty materials and components typically found in the higher priced units from many manufacturers. A fire extinguisher is a storage container for an agent like water or chemicals. They can be labelled with classes A, B, C or D. Always ensure that you use the right extinguisher for the appropriate type of fire. Ordinary Combustibles – Fires started with paper, wood, drapes and upholstery require a Class A type extinguisher. Flammable and Combustible Liquids – Fires originating from fuel oil, gasoline, paint, grease in a frying pan, solvents and other flammable liquids require a Class B type extinguisher. Electrical Equipment – Fires started with wiring, overheated fuse boxes, conductors, and other electrical sources require a Class C type extinguisher. Metals – Certain metals such as magnesium and sodium require a special dry powder Class D type extinguisher. There are numerous types and sizes of fire extinguishers, below you can find links to each category available in our range. For more information or to discuss your requirements simply contact us using form or call 1850 92982. Our mobile fire points are extremely robust, made from mild steel painted red. Designed to be able to hold 2 of all types of extinguishers. There is also room for a rotary bell (holes are pre-drilled for ease of fitting) and a fire bucket (extinguishers, bucket & bell supplied separately). For more information about our wide products range please refer to our on-line catalogue.